I am exhausted so this will be a short post. The handheld game pictured on the left is the reason for my exhaustion. For years I have bought this game as a gift every time someone I know moved into a new home. Apparently, it has been awhile since I have purchased one because I was unaware that this item has been discontinued. Horrified, I began numerous Internet searches sure that I could find one. Oh yeah, I did. A new, never been used ranges from $145.00 to $225.00. Foolish me put money into the stock market instead of scapping these up and hoarding them until a Yahtzee addict needed a fix. Used models average $55.00. Upon learning this I gently examined the last two units in my house. There was a moment I considered putting at least one up on eBay but quickly banished the thought from my head. 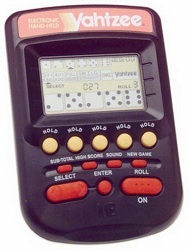 Sadness crept over me as I realized my beloved handheld Yahtzee games may be nearing their life expectancy and therefore extinction. I can only hope that a retro version will be issued sometime within the next 20 years and that my two will last until then. Of course by that time, my vision will be so bad that I may not be able to see the screen but I will hoard them for the next black market opportunity.